In a field with thousands of practitioners around the world –and many more on the way – it’s never been more important for the up-and-coming PR pro to stand out. Simply said, you want to make an impression and you want to be remembered. I’ve come a long way from where I was 5 years ago (still have a long way to go), but there’s no way I would have achieved half the things I have without the priceless advice I received from life-changing mentors. I am about to share with you what has brought me much success. Please note that these are not in order of importance. • Find Your Passions. Mine are, you guessed right – guitar and pr. Whether you’re into sports, cars, fashion, pets, you name it – go for it! Take your passions and STRIDE. Find a creative way to mix them and make them work together. • Work Hard. Nothing in life that’s worth it is easy. 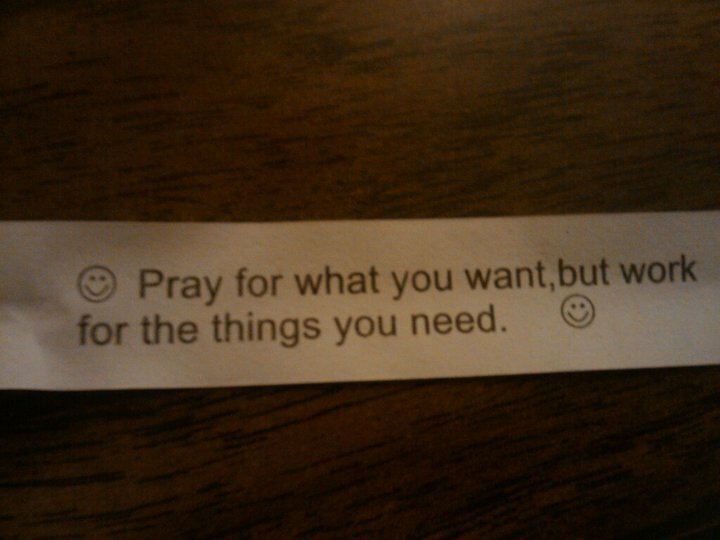 As the fortune cookie below says, “pray for what you want, but work for the things you need.” Achieving what you want will require many sacrifices, but the payoff is tremendously rewarding. Skip a Taco Tuesday or a night out downtown to devote to your career. • Love What You Do. There’s no point in wasting your energy on something you’re not madly in love with. If you don’t love what you do, not only will you be miserable, but you’ll make others around you miserable as well. So drop it like it’s hot and continue on a pursuit to find your calling. • Get a Website. Instead of spending $14 a month on coffee or beer, use that money to pay for your domain. It’s cheap, it’s easy, and, well, let me put it this way: if you’re not on the web, you don’t exist. • Get a Twitter account. Wait, let me finish… get a Twitter account and USE IT. Twitter has proven to be the most effective way to connect immediately with people with similar interests as yours. It has never been easier to engage in massive, super-networking and to get your message across. • Learn. Knowledge is power. The fact that you “don’t know how to use Twitter” or, “have no idea how to set up a website,” may be stopping you from actually creating an online presence (and therefore tremendously hindering your career). You learn through trial and error! Teach yourself; that’s how I did it. • Get Involved. I cannot stress the importance of this enough. People won’t know of your existence if you’re crawled up in your dorm. Go to as many mixers, workshops, conferences, meetings, etc., as you possibly can. This is called “networking,” you know, like working your net. If you and your roommates are the only one in your net, then you’re in a state of emergency. • Be fearless. Be real. Fear is your worst enemy. It also has a very strong stench and people can easily sense when you’re scared or putting up walls. So, my advice, be real and be yourself. Remember, you are only talking to other human beings. Be as organic as your homegrown tomatoes. • Invest in a Designer. Keyword here is INVEST. Branding and image play a crucial role in how people remember you. Do you want people to think of you as a random, generic person? Or, do you want people to think of you as a “wow, he/she really is different. What an awesome brand!” type of person? • Foster relationships. Let’s not forget that one of the bedrocks of public relations is to foster relationships. It doesn’t matter how many people you’ve exchanged business cards with, if you don’t establish a solid and genuine relationship with them, it’ll all be in vain. Keep in touch and keep it real. It is my hope that these tips inspire you and bring you as much success as they have brought me. Tienes razon who knows you, es muy importante en el mundo de las relaciones publicas. No podemos decir que hacemos un buen trabajo por nosotros mismos si no hay gente que pueda probar que asi lo hicimos. Me gusto mucho la parte de tu areticulo enla cual hablas de la galleta china, trabajar por lo que quieres. No es solo tner el deseo es trabajar para que ese deseo sea realidad. Pienso que somos artifices de nuestros propios triumfos y oportunidades,Gracias por hacernos reflexionar. Couldn't agree with you more, Pauline! I love how creative, genuine, fun, and useful all your tips are! So true about hard work, sometimes you need to say no to your friends who ask you to go out, stay in and invest in your career. Nice how you ended it with relationships, which is the FOUNDATION of establishing and maintaining a successful career in public relations and life in general. "Instead of spending $14 a month on coffee…"